The headlines continue to trumpet good news about the housing market, including falling vacancy rates and increased construction in rental housing markets across the country. But the flip side of this good news for the rental market is that the share of renters who face severe cost burdens, paying more than half their income for housing, has surged in recent years. As documented in our most recent State of the Nation’s Housing report, the number of renter households facing severe cost burdens reached a new record of 11.2 million in 2011, an increase of 2.5 million households since just before the recession in 2007 (see Figure 1). To make matters worse, this rise comes on the heels of what had already been a decade of worsening rental affordability; the number of renters facing severe housing cost burdens increased by 1.4 million between 2001 and 2007. 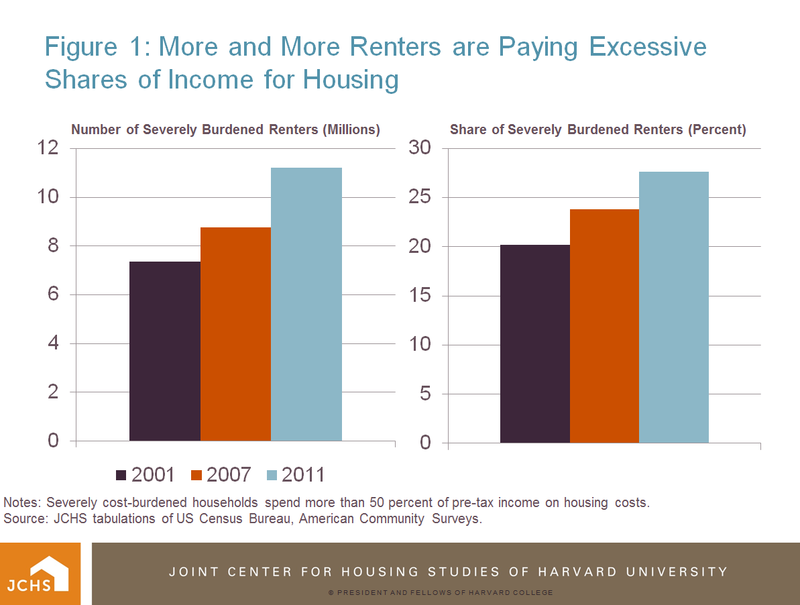 In all, the decade from 2001 to 2011 saw an increase of more than 50 percent in the incidence of severe rental cost burdens. Notes: Severely cost-burdened households spend more than 50 percent of pre-tax income on housing costs. Source: JCHS tabulations of US Census Bureau, American Community Surveys. To a substantial degree, the sharp rise in renter cost burdens reflects the significant growth in the number of low-income renters who are most likely to struggle to afford housing. Between 2007 and 2011 the Great Recession pushed the number of renters earning less than $15,000 up by 1.8 million, while those earning between $15,000 and $30,000 rose by 1.1 million. ($15,000 roughly corresponds to what is earned by those working year round at the federal minimum wage.) But over the same time frame, rising rents made it even more likely that households within these income bands would face severe burdens. Over this four year period, the share severely burdened households among those earning less than $15,000 rose from 67 to 71 percent, while among those earning between $15,000 and $30,000 the share rose from 29 to 33 percent. But while the number of low-income renters has risen sharply, the supply of housing they can afford has at best remained stagnant (see Figure 2). In 2011 there were 12.1 million extremely low-income renters who earned 30 percent or less of median incomes in the areas where they lived. (This is a common income cutoff for eligibility for housing vouchers and is roughly equivalent to our $15,000 threshold but is adjusted for differences in area incomes and family size.) Meanwhile, there were only 6.8 million rental units affordable at this income cutoff, representing a gap of 5.3 million housing units. The shortage of affordable housing is made worse by the fact that many of these affordable units are occupied by higher income households. 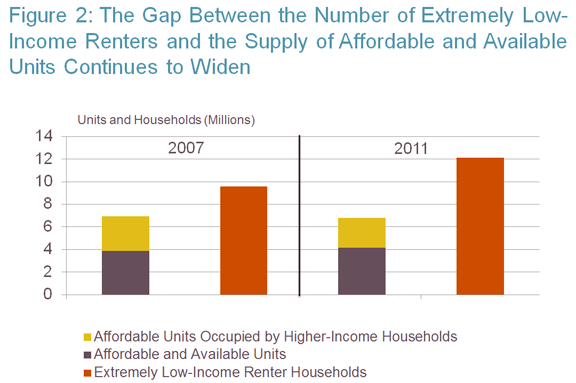 When the number of units affordable for extremely low-income households and available to them is considered, the supply gap in 2011 was even larger – 7.9 million units. 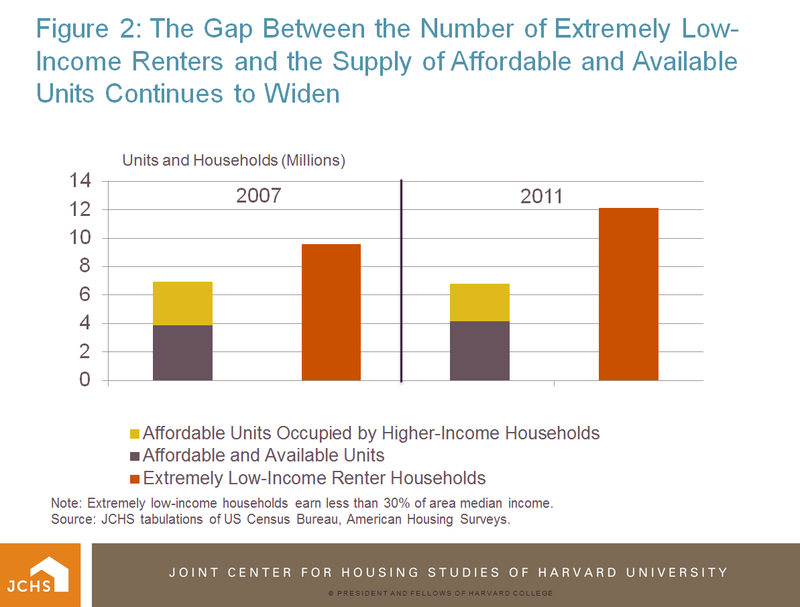 The magnitude of this supply gap testifies to the fact that it is nearly impossible to produce new housing at such low rents, and almost as difficult to maintain existing housing. In fact, 650,000 housing units renting for less than $400 a month in 2001 were permanently lost from the housing stock by 2011. Note: Extremely low-income households earn less than 30% of area median income. Source: JCHS tabulations of US Census Bureau, American Housing Surveys. With the market unable to supply housing affordable for the nation’s lowest-income households, addressing the problem of rising rent burdens may largely come down to efforts to increase household incomes. But there will always be some households facing temporary financial struggles and others facing long-term challenges who will need more assistance to afford decent housing. Currently, only one in four of those eligible for federal assistance are able to obtain subsidized housing. Those who do are among the nation’s most vulnerable families and individuals – 35 percent are disabled, 31 percent are age 62 or older, and 38 percent are single parents with children. With the population of households struggling to afford housing at record levels and continuing to expand, there is a compelling need to assess whether existing resources for assisted housing are both sufficient to meet the need and being used effectively through current programs. But while options for reforming the housing finance system have been subject to a vigorous debate, to date the issue of how to address the significant problem of rental housing affordability has received relatively little attention. The Bipartisan Policy Center’s (BPC) Housing Commission report this past year was a notable exception as it both framed the importance of this issue and advanced specific policy options that should be considered. 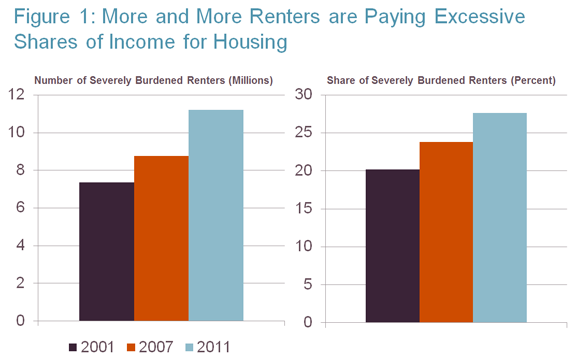 The next snapshot of renter cost burdens will come this fall when the 2012 American Community Survey is released. But as we showed in this year’s State of the Nation’s Housing report, rents are continuing to increase in markets across the country, against a backdrop of continued stagnation in household incomes. As a result, it is likely that this more up-to-date data will once again find that rental housing affordability has only gotten worse. Hopefully, the BPC report will start a dialogue on what should be done to address this urgent problem.